each poster shows the patches of the wings that flew each plane. Detailed captions provide bases, flying squadrons, etc. The Wing was SAC's primary operational unit. In general, a single wing occupied a base and the wing commander was also the base commander. Over the years, aircraft and mission changed, resulting in wings having many names. But all wings carried a numeric designation that remained constant. This section of our web contains a brief history of every known SAC wing. It is largely based on Air Force Combat Wings - Lineage and Honors History, by Charles A. Ravenstein, United States Air Force Historical Research Center. 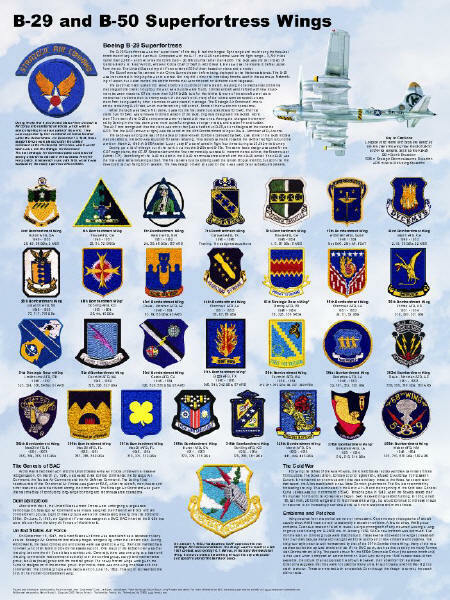 It contains an article on each wing that includes its emblem (patch), the aircraft it flew, the numbered Air Forces and Air Divisions to which it was assigned, it's operational squadrons, the bases where it was stationed, it's commanding officers and a brief summary of operations, honors and achievements. It was published in 1975, so contains no information after that date. These official wing histories provided the framework for the wing histories on this web. To that we have added information obtained from other sources, most of it from books and personal experiences provided by our visitors. One of the most challenging problems has been reconstructing events after 1975. Much of that information was provided by T/Sgt Ronald E. Mixer, USAF, Retired, who provided a copy of his Strategic air Command - An Organizational History. Much of the information on the National Guard Units and 4 digit wings comes from it. This is a large section, so we've divided the wings into several categories and provided introductory information and several navigational aids. Wing Home Page - Where you are now. Organization - Provides a brief description of Wing organization and components. Index - Lists all wings known to have been assigned to SAC. Quickest way to locate any wing history. include 4-digit wings, fighter wings, national guard, etc. 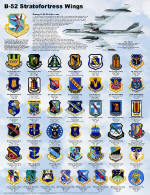 Who Flew What When - A huge chart listing all Constituted Combat Wings and what they flew year by year. Links to the history of each. One of our most popular pages, but very big. Takes 30-40 seconds to download with 56K modem..
"Primary Combat Wings," is a term invented by the author to distinguish these wings from the other constituted combat wings. 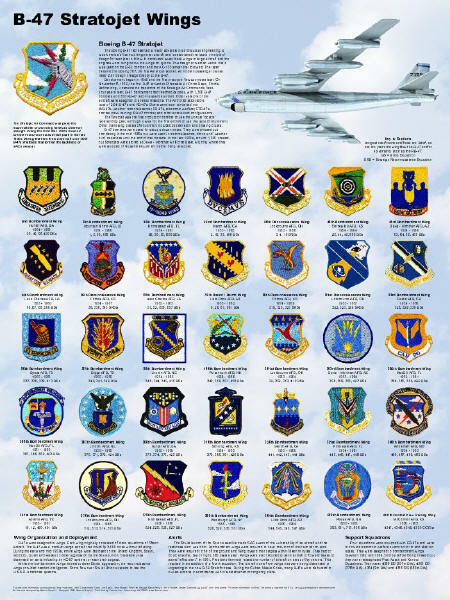 These do not include the Fighter Wings and National Guard wings, which are listed separately. one, two or three digit designations. They are "permanent," in that they can undergo inactivations and activations and still retain their lineage and honors. In theory, all of SAC former bomb and missile wings are still alive, just inactive, waiting around for someone to reactive them. All of SAC's newly formed bomb and missile wings were constituted combat wings. So as to perpetuate the histories and honors of World War II units, they were given the same numeric designations as earlier units. In many cases, they were reactivated as groups, then redesignated as wings. This may have been to meet lineage and honors requirements. The one, two or three digit number is always expressed in Arabic terms, such as "1st." Examples include such units as the 1st Fighter Wing, 2nd Bombardment Wing, 90th Missile Wing, 497th Air Refueling Wing, etc. Original Bomb Groups - "Constituted Groups" that went into forming SAC in 1946. Most were soon inactivated. Fighter Wings - Yes, SAC had it's own fighters. Although these are Constituted Combat Wings, SAC's experience with fighters was short lived. All fighter wing histories summarized on one page. National Guard Wings - Activated and assigned to SAC for short terms. Major commands had the authority to establish their own wings. Unlike the Constituted Combat Wings these were considered temporary and their linage, history, awards and battle honors ended when they were inactivated and could never be revived. Such wings are given four-digit designations, such as the 4137th Strategic Wing. Although most of the four digit wings were Strategic Wings, four digit designations were used for many other wings. All known 4-digit command established wings are listed in the section.